Well hey there, supernatural fans. 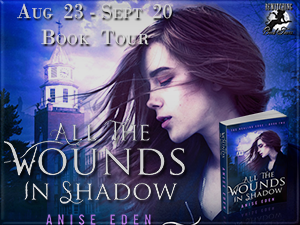 Today we're extra charged because author Anise Eden is stopping by to tell us a little bit about her new book ALL THE WOUNDS IN SHADOW (From the series The Healing Edge.) If you're a fan of Karen Robards or Shiloh Walker, chances are this book is right up your alley. Anise writes in the paranormal investigative romance genre for this series. This is book two from the series and although it would be great if you had read book one ALL THE BROKEN PLACES, if you haven't don't let it stop you from reading her newest story. You'll easily get up to speed with Cate and her group of alternative healers/investigators. So first, a little bit about the story. Therapist Cate Duncan has just accepted a job with the MacGregor Group, a unique collective of alternative healers. She’s excited by the prospect of honing her empathic healing techniques among others like herself—aura readers, telepaths, crystal healers, and more. The fact that Cate just started dating Ben, her magnetic new boss, is an added bonus. Before Cate can settle into her new routine, the poisoning of a prominent neuroscientist draws the entire MacGregor Group into both a federal investigation and an even more insidious threat. Protected by Ben’s former Marine Corps unit, Cate and her colleagues must use their alternative healing methods to solve the crime as their patient clings to life. The responsibility of discovering crucial information falls to Cate and her parapsychological powers. But for Cate, unraveling the mystery means reopening wounds that had just begun to heal—and in the environment of the Marine Corps unit, differences between Cate and Ben become clearer, straining their budding romance. When a new crisis looms, Cate must trust in her colleagues’ gifts and the strength of Ben’s love, finding the courage to confront her deepest and most terrifying demons—or her own life will be at risk. Whoa! I know right? So much intrigue. So much love. So little time. Sigh. SC: Tell me a little bit about your main character of this book. AE: Cate Duncan is a young psychotherapist who is trying to adjust after her world is turned upside-down. In the first book of The Healing Edge Series, ALL THE BROKEN PLACES, Cate is struggling after her mother's suicide. When she reaches out for help, she finds herself with the MacGregor Group, a clinic of alternative healers who also have paranormal gifts. There, she is introduced to the idea that she is an empath-something's she's never head of before—and is invited to join the Group as a healer. In this second book in the series, ALL THE WOUNDS IN SHADOW, Cate is thrown into the mix when the MacGregor Group is asked to use their unique gifts to try to save the life of a prominent neuroscientist, even as they help solve his attempted murder. The books are written from Cate's point of view, which as a writer I really enjoy. In addition to being someone with deep empathy and feeling, Cate is smart with a quirky sense of humor and a lot of inner strength. But like all of us, she is also flawed and human, dealing with serious emotional problems and a tendency to act independently and impulsively when asking for help might have been a better strategy. I love watching Cate courageously fight to grow in order to meet the new challenges that keep being placed in front of her. I hope her readers find themselves relating to her and rooting for her as much as I do. SC: Cate certainly has some unusual experiences. Do you believe in the paranormal yourself and if so, do you have an experience you can share? AE: It's hard to say whether I believe in "the paranormal," because that term means different things to different people. However, I have had some experiences that as yet are unexplained by science, and I've spoken to many people who have reported similar things. Through other's gifts, I've been able to receive contact from those who have passed on. I've also had incidents of "intuitive knowing," or knowing things instantly about loved ones who are miles away without having spoken to them. For now, these experiences would be categorized as ''paranormal,'' but I am of the opinion that we're at the very beginning of understanding how energy behaves, and that one day, physicists will uncover how these phenomena occur. In the meantime, I believe it would be foolish to dismiss the unusual experiences I've had just because I can't explain how they happened. That would be like a child denying that a flipping light switch turns on a light, simply because they don't yet understand how electricity works. The question of why we have these experiences, though, may always remain in the spiritual realm. SC: There's certainly lots left to discover. What are you working on now that you can tell us about? AE: Right now, I'm in the final stages of editing ALL THE LIGHT THERE IS, the third book in the Healing Edge Series, which is coming out Spring/Summer 2017. In this book, the MacGregor Group is thrown into a completely new setting full of mystery and intrigue, where they must face down an ominous threat. Meanwhile, Cate and Ben struggle to protect one another as their relationship continues to develop and deepen. I'm excited about all of the ways in which the various threads from the first two books are weaving together, and I look forward to sharing this final installment with readers! It was fun spending some time with Anise. You can get link to her Amazon page below. 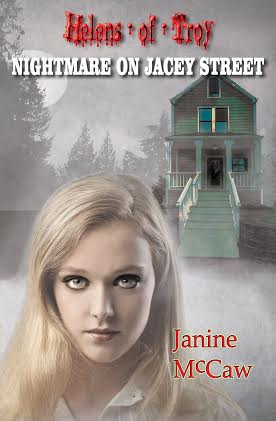 Supernatural Central would like to thank BEWITCHING BOOK TOURS for introducing us to Anise. Supernatural Central was not paid for any part of this interview. Our opinions, as always, are our own. I really enjoyed reading the synopsis of your book, and also reading the questions and your answers. I am a lover of all things Paranormal.!! Thanks for stopping by, Sandra. We'll have lots more interviews coming up.